At Sri Vijaya Emperor Sangirama Vijayotungavarman unlike during the period of his predecessors the good hostilities that existed between these two empires broke. This probably occured due to him not withstanding to see the flourishing Chola trade in the South-East Asian region and with China, as against the trade of Sri Vijaya empire in these regions. He imposed some drastic trade laws and heavy taxes detrimental to the already flourishing Chola trade especially in the in the kingdom of Kadarem among the Indian colony of traders in the Bujang valley region which was under the sway of the Sri Vijaya empire. The above course of action would have been instituted by the Emperor Sangirama Vijayotungavarman of Sri Vijaya through his viceroy at Kadarem namely the king Linggi Johan, which would have caused much damages to the flourishing Chola trade at Kadarem and caused much anger to the already aggressive and imperialistic Cholas. maa perum thandaatkonda Ko Parakesaripanmaraana Udaiyaar Sri Rajendra Chola Thevarkku aandu....."
South Indian Inscription Vol 1, Inscription No: 66, page 98. The mighty Chola forces crossed seas and reached Nakkavarem the present Nicobar island which was captured and brought under their rule. It appears this island was made the centre of their operations for their capture of Kadarem and Sri Vijaya. "......Alai kadal naduvul pala Kalam seluththi......thenakkalar polil Maa-Nakkavaaramum......maa perum thandaatkonda Ko Parakesaripanmaraana Udaiyaar Sri Rajendra Chola Thevarkku aandu....."
Inscription of Rajendra Chola - 1 South Indian Inscription Vol 1, Inscription No: 66, page 98. "......Alai kadal naduvul pala Kalam seluththi......kalai thakkoar pukalth Thalai-Thakkolamum......maa perum thandaatkonda Ko Parakesaripanmaraana Udaiyaar Sri Rajendra Chola Thevarkku aandu....."
The valiant Chola fleet reached the kingdom of Sri Vijaya also known as Sri Vijayapura in the island of Suvarnadvipa alias Suvarnapura - the island Sumatra, and defeated the (overlord) king of Kadarem (Kataka) - who was the Emperor of the mighty Sri Vijaya empire the Sangirama Vijayotungavarman (A.D.1020-1023) of the Sailendra dynasty. The Chola forces captured his fortress Malayagiri at his capital city the Vijayanagara. He was taken captive along with the elephants of his glorious army, large heaps of treasures and the Vidyaadhara Thoranam (arch) at the war-gate of his extensive capital city the Sri Vijaya (nagara) with the jewelled-wicket gate adorned with great splendour and the gate of large jewels. His extensive kingdom of Sri Vijaya which covered approximately the present South Sumatra, Lampung and Benkulu provinces of the island Sumatra came under the fold of the mighty Chola empire, and a Chola Prince was appointed as the viceroy of this kingdom. However the family members and daughter of Sangramavijayotungvarman went to West Java for safety. The forces now directed their attention on territories which were under the sway of the Sri Vijaya empire. kanakamani kathavamum, nirai Sri Vijayamum......maa perum thandaatkonda Ko Parakesaripanmaraana Udaiyaar Sri Rajendra Chola Thevarkku aandu....."
The Chola forces next crossed over and captured Mevilibankam the present Banka island neighbouring the south-east coastel region of Sumatra opposite the Sri Vijaya kingdom. The ruling king of this region is not known. However the Mevilibankam too was under th sway of Sri Vijaya empire duing this period. "......Alai kadal naduvul pala Kalam seluththi.......kaavalam purisai Mevili-Bangkamum.....maa perum thandaatkonda Ko ParakesaripanmUdaiyaar Sri Rajendra Chola Thevarkku aandu....."
The forces from here moved into Malaiyur (Melayuu) in the mainland of Sumatra, a mountainous region approximately comprising the present Jambi and Perkanbaru states of central Sumatra which too they captured and brought under their control. The city fortress of Malaiyur was located at the Jambi proper adjacent to the river Batanghari. "......Alai kadal naduvul pala Kalam seluththi......nanmalai uur eyil thon Malaiyuurum,.....maa perum thandaatkonda Ko Parakesaripanmaraana Udaiyaar Sri Rajendra Chola Thevarkku aandu......"
They continued with their naval expedition and captured Pannai (Pane). in the north of Sumatra. Here they set a garrison probably for the protetion of the interests of the numerous Chola traders in this region. The Chola army thereafter crossed seas. "......Alai kadal naduvul pala Kalam seluththi......thuraineer Pannaiyum.......maa perum thandaatkonda Ko Parakesaripanmaraana Udaiyaar Sri Rajendra Chola Thevarkku aandu....."
From here they proceeded to Ilamuridesam (Lemuri) approximatly covering the present Acheh province in the extreme north of the island Sumatra, conquered the territory and brought that too under their rule. "......Alai kadal naduvul pala Kalam seluththi.......kalaamuthi kadunthiral Ilaamurithesamum .......maa perum thandaatkonda Ko Parakesaripanmaraana Udaiyaar Sri Rajendra Chola Thevarkku aandu....."
The Chola army thereafter crossed seas and reached Kadarem to join the earlier division of their army lead by the grandson of Rajendra Chola - 1. The Cholas fleet lead by the grandson of Rajendra Chola - 1, reached the kingdom of Kadaaram and landed at the estuary of Perak River and reached the Ganganagar (Kataka-nagara) it's capital city. They defeated the ruling king of Kadarem the Linga Yohan (Linggi Johan) the viceroy of the Emperor Sangiraama Vijayotungavarman of Sri Vijaya, who met his death in this war, captured and his city the Ganga Nagar. Later he appointed a Chola viceroy at Kadaaram to rule the kingdom which now became a part of the Chola empire. The grandson of Rajendra Chola - 1 married Putri Gangga the daughter of the king of Kadaaram the Linga Yohan. This war appears not to have disturbed the Indian colony of traders in the Bujang valley region in th present Kedah province, but strengthened their position more in the kingdom of Kadarem. "......Alai kadal naduvul pala Kalam seluththi......thodukadal kaaval Kadaaramum......maa perum thandaatkonda Ko Parakesaripanmaraana Udaiyaar Sri Rajendra Chola Thevarkku aandu....."
".......To him was born the son, the king named Mathuranthaha who was the punisher of the insubordinate and who.....with (the help) of his forces which crossed seas, which were excessively powerful in arms and which had scattered away the armies of all his enemies he burnt Kataha that could not be set on fire by others what is impossible for this Rajendra Chola!...." Copper Plates of Rajendra Chola - 1 of Thiruvalankadu temple, Thanjavur District, Tamil Nadu, India. "......by utterly defeating with no mercy the four fold army of Kataka and overpowering the powerful master of that place, Rajendra forcibly took possession of the enormous gold that had been amassed there......"
"......the king Mathuranthahan......crossed the ocean and attacked vehemently the Kadaarem......"
Copper Plates of Rajendra Chola - 1 of Thiribhuwanamadevi Chathurvedimangalam in Thanjavur, Tamil Nadu. ".......Hail Prosperity! In the twenty nineth year of king Parakesarivamar alias Udaiyar Sri Rajendra Choladevar who conquered Purvadesam, Gangai, and Kadarem......"
Inscription of Rajendra Chola - 1 in the inner sanctum of Koneriswarer Temple at Agatheeswarem in Kanyakumari district, Tamil Nadu, India. ".......the same person obtained lands for the temple from the king's (Rajathiraja Chola's) father who was pleased to take the Purvadesam, Gangai and Kidarem...."
Inscription of Rajathiraja Chola - 1 at Thiruvenkadu temple in Thanjavur district, Tamil Nadu. "......also gifts in year twenty seven of Periyadevar who conquered Purvadesam, Gangai, and Kadarem and in year thirty one of Rajathiraja....."
Inscription if Rajathiraja Chola in Thiruvaiyar temple, Thanjavur district, Tamilnadu, India. "......ayyar who took Gangai, Purvadesam and Kadarem....."
Inscription of Virarajendra in front of the central shrine of Thiruttalisvara temple at Thirupputur, Madurai district, Tamil Nadu. ".......gifted by Ulagudaiyal queen of (one) who took Gangai, Kidarem and Purvadesam....."
Inscription of Rajendra chola - 1 on the central shrine in Ammanathaswami temple at Seramadevi in Tinnevely district, Tamil Nadu. ".......the Sembiyan captured Kadaarem with cold clear wavy roaring sea and kept the country under his rule......"
Kalingaththu Parani - by Jeyamkondaar, edited by Puliyuur Kesikan, chapter 8, page 104. ".......with mace captured the river Ganga and Kadaarem, and lived in Gangapuri the glorious (king)......."
".......like the lion which attacked the elepant captured Kadaarem and Gangai and occupied the lion throne......"
From Kadarem the forces moved in the eastern direction heading to Ilangasokam (Lankasuka) approximately encompassing the present Songkhla, Pattani, Yala and Narathiwat states of present south Thailand. Chola forces captured Illangasokam and installed another prince as viceroy of this kingdom. "......Alai kadal naduvul pala Kalam seluththi.......kalangaa valvinai Ilangaasokamum.....maa perum thandaatkonda Ko Parakesaripanmaraana Udaiyaar Sri Rajendra Chola Thevarkku aandu....."
From Ilangasokam the Chola forces further proceeded toward south-east direction to Valaipanthur (Valai Penjuru) in the present Kelantan state of Malaysia. "......Alai kadal naduvul pala Kalam seluththi.......vilaip panthurudai Valaipanthurum.....maa perum thandaatkonda Ko Parakesaripanmaraana Udaiyaar Sri Rajendra Chola Thevarkku aandu....."
Chola forces continued with their expedition and moved towards the south of peninsular Malaysia and captured Maayirudingham surrounded by deep sea. They destroyed the fortress named Klenggiu (Glang Gui) near the tributory Lenggui of the Johore river and defeated the ruling king Chulin of this region and gained much wealth from this kingdom. Rajendra Chola -1's grandson was offered the daughter Puteri Onangki (Onang Kiu) of the king Chulin of Maayirudingam whom he married. Subsequently this unit of forces returned to Kadarem by sea to join the other two units of the Chola forces. "......Alai kadal naduvul pala Kalam seluththi.......aal kadal ahal sool Maa-Yirudingamum.....maa perum thandaatkonda Ko Parakesaripanmaraana Udaiyaar Sri Rajendra Chola Thevarkku aandu....."
"......Alai kadal naduvul pala Kalam seluththi.......kalai thakkoar pukalth Thalai-Thakkolamum.....maa perum thandaatkonda Ko Parakesaripanmaraana Udaiyaar Sri Rajendra Chola Thevarkku aandu....."
Then they headed towards the east Ma-Thamaling (Tambaralinga) approximately covering the present Nakhon Sri Thamarat and Phatthalung states of south Thailand. The Chola fores moved back to Kadarem which was joined by the fleet that returned from the Sumatran expedition. "......Alai kadal naduvul pala Kalam seluththi....... theethamar valvinai Maa-Thamaalingamum.......maa perum thandaatkonda Ko Parakesaripanmaraana Udaiyaar Sri Rajendra Chola Thevarkku aandu....."
After the Chola forces completed their war expedition to Indonesia, Malaysia and South Thailand the Cambodian king Suriyavarman - 1 who was at war seeked the assistance of the Chola forces to win over his enemy. This request was ceded by the Chola forces who sent a joint expedition with the Cambodian forces which ended in a great victory to the Cambodian King. He in recognition of the great assistance provided at war by the Chola's forces gave his War Chariot with which he won over his enemies as his present to Rajendra Chola - 1. With this good Chola-Khamer relationship the Saivite Priests, Traders and Stone Sculpturers from Chola country gradually settled in the region of Angkor the capital city of the Khamer emperer Suriyavarman - 1. During this period an old Siva Temple at 'Banteay Srei' 30 Km from the Angkor Wat temple in Cambodia was 'expanded and and new sections were added to an existing Siva temple' evidently by the Chola forces and re-dedicated to God Siva, with the new name "Thiribuvanamahadeva Temple" after Rajendra Chola's own mother's name the "Thiribhuvanamahadevi". In this temple in it's second enclosure, on the Gopura over main entrance we see an image of Nadarajah represented with eight hands but not in the same style as the Nadarajah images in the Tamil Nadu with left leg lifted and with four hands. In the lower panel beneath the Nadarajah image on its right side we see an image of a Drummer playing the drums to the beat of the Dance of God Siva depicted as Nadarajah, and on the left we see an image "visibly and positively confirmed" as that of the Kaaraikaal Ammaiyar of the Chola Country being one of the 63 - Tamil Saiva Saints of Tamil Nadu. This Panel undoubtedly was carved by a Tamil Sculpturer apparently from Chola country in Tamil Nadu. ".....The Kamboja king aspiring for his (Rajendra's) friendship (and) in order to save his own fortunes sent him a triumphant Chariot, with which he had conquered the armies of the enemy kings in the battles......."
"......the Kamboja king who conquered his enemies with the help of Rajendra, gifted to him his War Chariot with which he won many battles......"
The joint forces on their return to Chola country captured the Ma-Pappalam of present Pegu region of Miyanmar (former Burma) where they planted their "Jeyathambam" and returned to Nagapattinam of Chola country. "......Alai kadal naduvul pala Kalam seluththi.......kaappuru nirai punal Maa-Pappaalamum.......maa perum thandaatkonda Ko Parakesaripanmaraana Udaiyaar Sri Rajendra Chola Thevarkku aandu....."
With the fall of Sri Vijaya which was an important centre of Buddhist learning in South-East Asia under the great Buddhist teacher Acharya Dharmakirti (alias Dharmapala) probably underwent disturbed conditions which curtailed the activities of the centre. His great deciple Dipankara Attisa who came to Sri Vijaya in A.D.1012 from North India to learn Buddhism under him, after twelve years of learning left to India in the year A.D 1025 not withstandng the troubled conditions that befell the country. The fate of the Acharya Dharmakirti (alias Dharmapala) and the monastry was unknown. It appears certain conquered teritories have been handed back to native kings who accepted the suzeranty of the Cholas and agreed to pay tributes. Thus all countries which were under the sway of the Sri Vijaya empire of South-East Asia came under the overlordship of the mighty Cola empire of Tamil Nadu, India. At Sri Vijaya the ruling Chola viceroy of Rajendra with a view of renewing the trade relations between China and Sri Vijaya sent an embassy to China in the year A.D.1028. This embassy was shown unusual honours by the Chinese emperor Jen Chung (A.D.1023-1064) in recognition of the mighty fame of Rajendra Chola - 1. To Cholas their conquer of Kadaarem was that which gave them the satisfaction of a great achievement inspite of their victory over many South-East Asian countries. Rajendra Chola - 1 after his astounding victory over Kadaarem (the Kedah region) of present Malaysia and it's annexation to his great Chola empire, assumed himself as "Rajendra Chola Kidaaratharaiyan" meaning the 'Rajendra Chola the king of Kidaarem' (Kadaarem). He further commemorating his great victory over Kadarem assumed the title as 'Kadaarem kondaan. A village known as Punjai near Mayilaaduthurai in Nagapattinam district, and another village near Thuraiyur in Thiruvarur district were named after this title as "Kadaarem kondaan". He to further commemorate this great event in the Chola history, also issued gold coins with his title 'Kadaarem kondaan' inscribed on them. The grandson of Rajendra Chola - 1 who lead the Kadaarem expediion successfully on behalf of him - the son of Rajendra Chola - 2 named Rajadhiraja was given the title 'Rajadhiraja Kadaaremkonda Cholan' meaning the Rajadhiraja Chola who conquered Kadaarem or in short the 'Kadaaremkonda Cholan'. In a later period two Immediate Executive Officers (Udankoottam) of the king Rajendra Chola - 2 were given the above titles in recognition of their services to him as Arattai Soran Kulamaanikkam alias Rajadhiraja Kadaarankonda Cholan Velan and another as Vasavayan Machchi alias Kidarankonda Chola Velan. He to commemorate this victory renamed a village at Pasalinadu in Manayirkottam - the present Perambakkam region in south Thiruvallur District of Tamil Nadu as 'Kadaaremkonda Cholapuram'. It was in the village Narasinghapuram of this region the then Mathurantaka Nallur Aalvar temple the present Narasimha Perumal temple exits today. The region of Thondaimaanaartruur in Jeyamkondacholamandalam the present Kalahasti of Andhara Pradesh there had been another village named as Kadaaremkonda Cholapuram. There had been yet another region named as Kidaaremkonda (Kadaaremkonda) Cholapuram in the former Thaanava Nadu, a region which had been at the boundry of present Keeramangalam in the Pudukkoattai region of Tamil Nadu. There had been a village named as Kidaaremkonda (Kadaaremkonda) Chola Nallur which has been a boundry of the former region of Aakkur Nadu of Jayamkonda Cholavala Nadu the present Mayavaram region of the Thanjavur Mawattam of Tamil Nadu. Also there had been a highway named as Kidaaremkonda (Kadaaremkonda) Chola Perumtheru at Vikkramacholapuram in the close proximity to the present Vikkrama Choliswarer temple in the Udaiyaar Paalayam in the Perambalur Maawattam of the Thiruvalluur district in Tamil Nadu. Further there had been a settlement of Vedic Priests at Naangur Nadu named Kadaaremkonda Chola Chathurvedi Mangalam at Mayiladuthurai region of the Nagapattinam district in Tamil Nadu. Rajendra Chola - 1 in recognition of the military services rendered by the Chola General Chola Brahmaraayer who lead one wing of the expedition to South-East Asia was decorated with the title Kadaaremkonda Chola Brahmaraayer after the war possibly in the year A.D.1025. Rajendra Chola - 1 towards the end of his rule in A.D.1044 before his death, to reward further his Senai Naayagam (Chief Military General) for his great military services provided during his period of rule gave him a new title as Rajendra Chola Brammaraayer, and gifted a kingdom within his own empire known as Thadigaivali (Thadikaipaadi) alias Vikkramachola mandalam the present Devanahalli and Hosakote regions in Karnataka State, as a life time endowment (Jivitham) to him. In the village Alur of this region a temple and a water tank was also built during this period. Further to celebrate this victory a Siva temple was built at the village Karaivali Valliyur at Paduvurkottam the present Gudimallur of Walajapet in Vellore district of Tamil Nadu, and was named as 'Kadaaremkonda Choliswaramudaiya Naayanar Koyil' the present Bhumisvara temple. 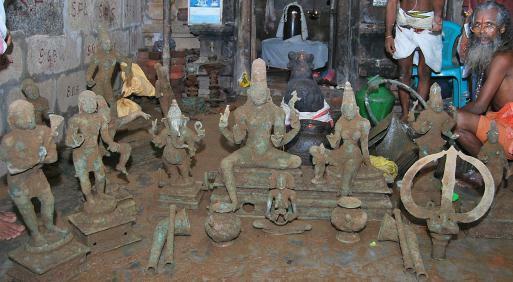 Cholas further to mark their triumph over Sri Vijaya built another Siva temple at Merkunadu a subdivision of Rajadhiraja valanadu, and named it as 'Vijayamkonda Choliswarem Udaiyar Koyil'. This temple was at the northern boundry of Merkunadu during which time there also existed in the central region of Merkunadu a temple named as Vaanavanmathevi Vinnakar Aalvar which is the present Kadambavaneswara temple at Erumbur in Cuddalore district (Kadalur mavattam) of Tamil Nadu. "Swasti Sri Rajendra Cholan Kidaaratharaiyan"
We note from the Inscriptions of the medieval Chola Kings that from time to time with their victory over certain kingdoms they assumed to themselves the titles expressing their authority over same. Initially we could see during Rajaraja cholans time as Chola Pandiyan, Chola Keralan etc. Subsequently we note they called themselves as (also) the kings of these kingdoms with their own names prefixed such as Rajendra Cholan Keralan, Kulothunga Chola Kadambarajan also as Kullotunga Chola Kadambaaraiyan. Likewise when Kulothunga Chola too won over Kadaarem assumed the title Kulothunga Chola Kidaarathuaraiyan. This is definitly the title assumed by the king on his own victory over Kadaarem and this title was conferred as honarary titles to the very close and faithfull servent-warriors (Vellaikaarer forces) of the king (who even dared to give their life to the king) to be attached to their own names. We could clearly see this clearly in the Inscription of Rajadhirajadevar - 2 (Inscriptions in Pudukkottai State - Part 1, Inscription No: 139) which states the name of the Vellaikarer who was named as Kulothunga Chola Kidaaraththu Araiyan aana Sadirasan Irasan. On this basis it could be clearly understood that the tituler name the "Swasti Sri Rajendra Cholan Kidaaratharaiyan" of Rajendra Chola -1 assumed after his victory over Kadaarem (Kedah of Malaysia) was also given to his faithfull Velaikkara Warrior in recognition of his services to Rajendra Chola - 1. ".......Vikrama Cholapuraththu Nagaraththoam vivaththai panninapadi engaloor Kidaaramkonda Chola perum theruvile munnaalil erandu kulang kalluviththu ikkulangal pothuvaaki......"
Inscription of Kulothunga Chola - 3 at Vikkiramamangalam Cholieswarer, Perambalur Mawattam, Udaiyaar Vattam. "......Ithu Saalai Kidaarangkonda Cholan Paramaswamikal uchchiyam pothu Amuthu seitharuluvathatkku mun Utthamaakkramaaka Saalai Kidaaramkonda Cholanennum thirunaamaththaal Saalai....."
"Purvadesamum Gangaiyum Kadaramum konda Ko Parakesaripanmarana Udaiyar Sri Rajendra Chola Devarkku yaandu 32 davathu, (Senai) nayagam Kadaremkonda Chola Brahmaraya sividattu (Jivitham - life interest)) Vikkrama Chola (Mandalaththu) Sannai naattu Alur....."
Note: Alur was a village at the present Devanahalli region near present Airport of Karnataka State. Alur Inscription of Rajendra Chola - 1 by S.Swaminathan, Asst Sup, Epigraphist A.S.I Mysore. My Research Article titled "The Medieval Chola Empire and it's relations with Malaysia, Indonesia, Singapore & Thailand", is an extension of my original Reaserach Paper in English titled "The Medieval Chola Empire and its relations with Malaysia and Indonesia" and read at the 6th International Tamil Conference/Seminar held at the University of Malaya in Kuala Lumpur Malaysia in the year - 1987, at the sessions presided by Dr Noburu Karashima and in the presense of Dr Singharavelu of the same University and many other Scholars from other countries. There are also Research Articles on the Chola Empire and its relations with countries in the Indian Mainland up to the North India inclusive of present Bangaladesh and east of West Pakistan in this same Website. The details of sources of Historical Evidences from Archaelogical Remains & Excavations, Inscriptions, original Historical Documents of the respective countries and from Tamil Nadu, Travel Writings etc etc also with relevent Photographs will be incorporated when these Research Articles are consolidated and published in a Printed Book Format. There is an original Research Article of mine on Kulothunga Cholas - 1's war expedition to South-East Asia and on his connections with Chinese Empire in Tamil, which is now stored in the Files Section of the Ponniyin Selvan Varalaattru Peravai Website with complete list evidences from Tamil Inscriptions and Tamil Historical Sources. Many of my Threads on other Subjects especially on Religion incorporates all evidences and sources, but Thread on Historical Studies only the Research Article titled "The great Significance of Kodungallur of Kerala in the History of Kerala and Tamil Nadu" incorporates complete list of References & Sources of evidences. The Readers who go through my lengthy articles may find it boring and may just read them on surface, and may miss many valuable informations on the subject of the respective Titles. For such Readers who have no patience to read peacefully through my lengthy articles, at least to highlight the important informations the muti-colour fonts are used. "The expansion of the Cholas from their base in the Kaveri Delta saw this growing power subdue the kingdoms of southern India, as well as occupy Sri Lanka and the Maldives, by the early eleventh century. It was also during this period that the Cholas initiated links with Song China. Concurrently, the Southeast Asian polity of Sriwijaya had, through its Sumatran and Malayan ports, come to occupy a key position in East-West maritime trade, requiring engagement with both Song China to the north and the Chola kingdom to its west. The apparently friendly relations pursued were, however, to be disrupted in 1025 by Chola naval expeditions against fourteen key port cities in Southeast Asia. This volume examines the background, course and effects of these expeditions, as well as the regional context of the events. It brings to light many aspects of this key period in Asian history. Unprecedented in the degree of detail assigned to the story of the Chola expeditions, this volume is also unique in that it includes translations of the contemporary Tamil and Sanskrit inscriptions relating to Southeast Asia and of the Song dynasty Chinese texts relating to the Chola Kingdom." It might be more useful to consolidate discussion and share academic sources than to start so many multicolored threads on the subject. With the switch-on from the "Old Mayyam Hub" to "New Mayyam Hub" each Thread had facilities only to accomodate a maximum of 10,000 charactors per Thread. After "my request" to the Owners of this Website, they improved the facilities in this Website to accommodate a maximum of 50,000 charactors per thread from earlier maximum of 10,000 charactors. Hence my 5 - Parts Article has now been reduced to 2 - parts. The EMPTY Part 3, Part 4 & Part 5 will be deleted by the Moderators (by Mr NOV) themselves soon, as we still lack the facilities to modify the Heading of each Threads, and also delete any of our own Threads unwanted - by ourselves like in the "Old Mayyam Hub".